We've extolled the virtues of working with book bloggers before, and for good reason. Engaging with the book blogging community is a smart move for authors – especially indie authors, whose book marketing and promotion is entirely their own responsibility. There are several different avenues for connecting with bloggers and promoting your book, but today we'll be taking a look at one particular strategy: the blog tour. Let's dive right into what a blog tour involves, why it's a good promo option for indie authors, and how to go about organising one. A blog tour is a little like a virtual/online version of a traditional in-person book promotion tour, in which an author attends events in a series of physical locations (like bookstores) to promote their latest book. As the name suggests, the 'stops' of a blog tour are various sites in the online book blogging community. The author makes an appearance on each blog, contributing content for posts (we'll discuss the usual types of content in further detail below). Early reviews of the book by each blogger are also generally part of any blog tour. A blog tour takes place over a scheduled period of time – usually one or two weeks – in the lead-up to the release of the author's latest book. 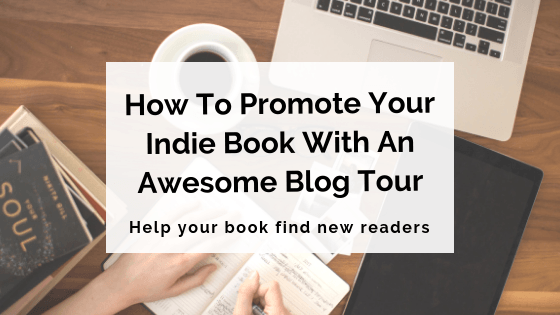 What are the benefits of a blog tour for indie authors? The amount of exposure across multiple bookish blogs is invaluable in generating awareness and excitement for a new book. The aim of the game is to get yourself, your book and your author brand out there in front of as many potential readers as possible. Through working with bloggers to put together the tour, you'll be forging great contacts and establishing valuable relationships within the online book community. You might even recruit some members for your indie author street team! For authors who don't have the time, funds or resources to organise a physical book tour, or who aren't comfortable with public speaking or being the centre of attention at an in-person event, a virtual tour is the perfect option. Let's break the process of organising and implementing a blog tour into five straightforward steps. If you've already been through the process of sourcing reviews for your book, it's likely you already have contacts in the blogging community who might be interested in participating in your blog tour. But if you don't, or if you need a few more to fill out a full tour schedule, spend some time exploring the blogosphere and identifying people to reach out to. It's important to look for blogs that are relevant to your book's genre and target audience. For example, if you've written an adult literary fiction novel, there's no point reaching out to bloggers who focus on YA books or genre fiction. Once you've decided on some bloggers you like, contact them with an introduction to yourself, your book and your aim to organise a blog tour, and ask if they might be interested in participating. Offer them an ARC (advance reader copy) of the novel for review, then talk about what other content they might feature (more on this in Step 2). When you've locked in your bloggers, liaise with them to create a set schedule for the blog tour. Ensure there will be something posted on a different blog every day of the tour, and that everyone is clear on which day their content is due to be posted. After you've filled all the slots on your blog tour schedule, it's time to decide what kind of content you're going to be contributing to each blog. This should be discussed with each individual blogger, and should differ from blog to blog so that the tour contains a variety of different types of posts. Guest posts on a topic of the author's choice. Think about the audience of each particular blog and the types of posts they like to read, whether this be musings on the genre in which you write, a little insight into the book itself, a chat about your writing process etc. Any other content you need to provide, such as a high-resolution image of your book cover, an author bio/photo, your book's blurb etc. Then it's time to create your content! Have fun with this part, and make sure you submit to each blogger promptly so they have plenty of time to create and schedule their posts. It's important that you support and promote the blog tour on your own platform, both in the lead-up to and throughout the tour period. Let your followers know a blog tour is coming up, and perhaps even post the schedule so they know which blogs to visit and when. Throughout the tour, share posts and links on your own social media channels as each 'stop' goes live and bloggers share the posts on their platforms. Remember that online collaborations like these are a two-way street. Your book and author brand are getting exposure through bloggers' channels, so it's only fair that you promote their blogs to your audiences as well. Once the blog tour has concluded, it's really important to follow up with all the bloggers who participated. Send each blogger a message thanking them again for their involvement in the tour. If you're happy with each participant's involvement, let them know you'll stay in touch if they're interested in potential future collaborations. Organising a blog tour often means beginning many mutually beneficial relationships with book bloggers that will continue throughout your career. Have you ever organised or participated in a blog tour? We'd love to hear your experiences in the comments below! Thanks for an incredibly useful and supportive articles and site for new authors. However, as the genre I am interested in is children’s picture books rather then fantasy, can you suggest someone who, like you, is interested in perfecting book manuscripts, but in that genre? You’re very welcome! Glad the post was useful for you. Unfortunately I don’t personally know of any picture book editors I can immediately recommend to you, but depending on where you live, a Google search such as ‘picture book editor + [location]’ or ‘children’s book editor + [location]’ is a great place to start. I’d also recommend browsing any editors’ networks in your country, as these often list accomplished editors and their preferred genres. All the best with your picture book!